Leaving your pet pooch home alone can be traumatic for them and worrying for you. If only you could check up on them from work or while out with the family. With a dog camera you can do just that, and much more. But, with so many different cameras on the market, how do you know which is best for you and your dog. Our panel of pet experts and dog lovers have put together a list of the best dog cameras to help you make the right decision for your needs. 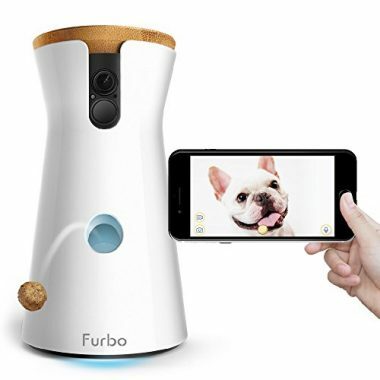 The Furbo Dog Camera was designed with input from over 5,000 pet experts and owners. Specifically created to meet the needs of dogs and owners it includes a range of unique features, including a treat toss; enabling you to treat and reward your dog, even when you are away from home. The camera has a 160-degree wide-angle lens, night vision, and zoom function, so you don’t miss a moment, night or day. It also includes an adjustable bark alert and 2-way audio, so you can hear and speak to your dog. The unique camera not only streams video in real time, but also includes real time dog alerts. These are received through the Smart phone app and enable you to know when your dog is active and when anyone else enters the camera range. For owners that want still pictures of their pet pooch, it also includes a selfie mode. 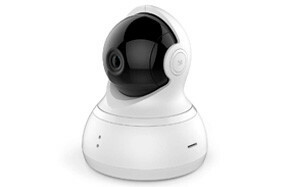 The TENVIS HD IP Camera includes 1280 mega pixel camera with high-tech optic lens to give the best quality video images. It comes complete with night vision infrared light, which has a 32ft range for quality pictures and a potential range of 50ft. The camera unit includes 128GB of storage space, so you can replay video as well as watch live streams through your Smart device. The rotate and tilt functions give 340-degree coverage horizontally and 105-degree vertical coverage, meaning fewer spots in your home where your dog is not able to be seen. The fast frame rate means it is ideal for tracking fast moving objects, so perfect for the more playful pets that are left at home. 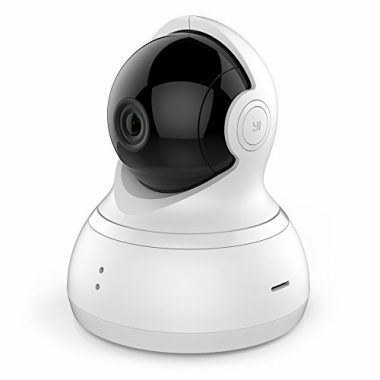 The bi-directional rotation range and 112-degree wide-angle professional grade lens means that YI Dome Camera offers almost complete coverage of the space where it is situated. The camera captures panoramic scenes, so not only can you see what your dog is doing, but you can place it in context with the rest of the room. The camera comes complete with encrypted Cloud storage, meaning that your footage is securely stored, even if anything happens to the camera. It also includes motion detection, so it reacts when you dog, or anyone else, enters the room, and captures their movement. You can also set the camera to cruise through specific locations within its range. So, you can monitor all your pet pooch’s favorite spots. The ultra-responsive microphone and speaker means that you can communicate with your dog, helping them feel more secure even when you are not at home. 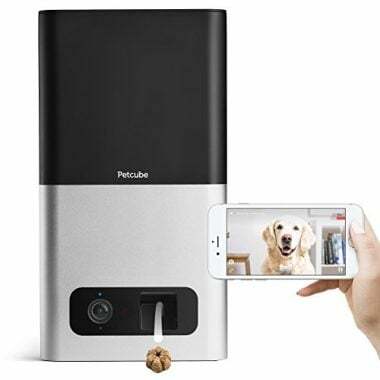 The Petcube Bites Pet Camera with Treat Dispenser is fully compatible with Alexa and Amazon Dash Replenishment, so you can treat your pet remotely, and be confident that you will never run out of treats again. You can pre-program the number and frequency of the treats that are dispensed. The camera itself provides 1080p HD video, 138-degree wide angle view, night vision mode, 2-way audio, and sound and motion alerts, so you will never miss another moment of your dog’s antics when you are at work. Cloud storage enables you to play back recordings of your dog, so you can monitor and check on behavior and look for signs of things like separation anxiety. 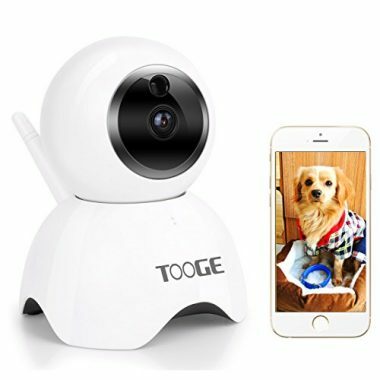 The TOOGE Pet Camera offers infrared night vision, two-way audio, and motion detection to give you peace of mind when you are away from your four-legged friend. As well as its basic functions the camera allows multiple users to view the camera simultaneously, on different devices, in different locations. This means the whole family can watch what the family pet gets up to when you are not there. 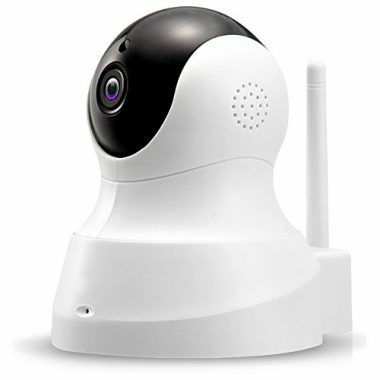 The camera comes complete with high-level protection, making it difficult to hack when it is connected to your Wi-Fi. It also performs regular self-checks to ensure it is working normally. If it reboots the head of the camera shakes before it tries to reconnect to your router. The camera is compatible with Windows, iOS, and Android operating systems and requires 2.4G Wi-Fi. The interactive camera from PetChatz provides a fully interactive experience for your dog. As well as enabling you to speak to your pet when you are away from home, you can give them treats, and they can keep their minds active with brain games. The PetChatz camera attaches to your wall at the right height for your dog to be able to easily see into the camera and connects via an app to your Smart device, laptop, or desktop computer. 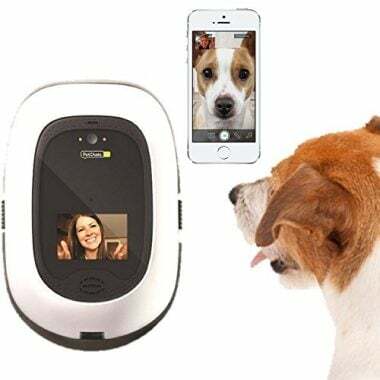 The camera includes an aromatherapy dispenser to help calm nervous pets or those that suffer from separation anxiety; it can even stream DOGTV. PetWatch automatically detects movement and sound and records 30 seconds of video for you to download and watch when you get home. Knowing the range of best dog cameras that are available to help you keep a watchful eye on your dog is only part of the answer to finding the right one for you. It also helps to know more about dog cameras in general, what they are used for, and what to look for when choosing a pet surveillance camera. In this part of the buying guide we explore these areas and cover key questions related to buying a dog monitor camera. What Is A Dog Camera? A dog camera allows you to see what your pet pooch gets up to when you are out of the house. Such cameras stream live video in real time to an app that you have on your Smart device, computer, or tablet. This means that you can see everything your dog does within the range of the camera lens. 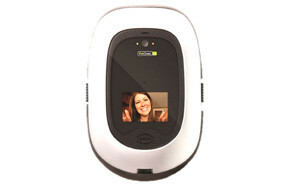 Most dog cameras also allow you to communicate with your dog through a two-way audio link. This means that you can calm an anxious dog, monitor their barking, and speak to them when you are missing them. Top of the range dog cameras often has a range of other features to help you feel closer to your dog when you are not there, and which help to keep them safe. These including sound and motion sensors and treat dispensers. You want a camera that provides clear video of your dog. This requires a high-quality lens and high resolution on the feedback. Most of the best cameras have 1080 megapixels and high definition playback. You certainly do not want to go lower than 720 pixels, otherwise, you will lose picture clarity. This allows you to get a closer look at specific areas that the dog camera covers. This is ideal for checking whether your dog has eaten, what a specific mess might be, or checking on them when they are sleeping. Being able to move the camera angle gives you a much clear picture of the whole space where your dog is and ensures that there are fewer spots that are not covered by the dog camera. Pan and tilt modes allow you to move to specific areas of the room, for example checking doors or windows, especially if you notice your dog has become agitated. If the dog camera you are considering does not have pan and tilt functions, then ensure it has a wide-angle lens to take in as much of its surroundings as possible. To be fully beneficial, cameras with two-way audio need to include noise canceling microphones and high-quality speakers. If your voice is not clear, your dog may not realize it is you and become more agitated, rather than less so. This allows you to see your dog clearly, regardless of light conditions within your home. It is ideal if you work nights, or are enjoying an evening out, but also means you can check on your dog without disturbing when you are home at night. With motion detection cameras, you receive push notifications to your smart device when your dog is within the cameras visual range. This means you can watch them when they are near the camera, rather than waiting by your phone for ages watching an empty space. Motion detection also allows you to watch for other people entering your home, from dog walkers to intruders, giving you extra peace of mind. An additional benefit that some of the top cameras have is sound detection, so you are alerted to increased levels of sound within the house. It is important to look for a camera where the sound detection levels are adjustable. The main purpose of a dog camera is to be able to see your four-legged friend, even when you are not there. Given this, it is essential that the dog camera package includes remote viewing. Check the compatibility of the app that is part of the package, as well as the Wi-Fi requirements and what security is in place to ensure a safe and private connection between your device and the dog camera. Provide comfort for your dog. Allow you to immediately correct inappropriate behavior. Create lasting memories of your pet – especially if the camera takes still photos or records video. Provide stimulation through a dog camera treat dispenser. Being able to watch your dog when you leave the house helps you to recognize the signs and symptoms of separation issues and to identify how long after you leave these symptoms to occur. This can help you determine how long you can safely leave your pet, and to begin a program of desensitization to be able to increase this time. A dog camera that has interactive capabilities also enables your dog to feel less alone in the home when you are not there. Being able to hear your voice, and in some cases see you, can have a calming effect on dogs who experience separation issues. If the camera also has a treat function, then when you see your dog reacting positively to being alone you can provide an immediate reward for the behavior. Dog camera treat dispensers also provide a way of keeping your dog occupied, so they focus less on the fact that you are not present. If you sent the dispenser to provide treats at random times during the day, then your dog will focus on when the next treats are coming, rather than on waiting for you to return. Q: Why Should I Buy a Dog Camera? A: To give you peace of mind that your dog is safe and well while you are out of the house. It also has the added benefit of providing a way to communicate with your dog and reinforce positive behaviors when you are not present. Q: How do I set up a dog camera? A: Firstly, place the dog camera in a part of the room that provides the best coverage of that room. Follow the specific instructions provided by the manufacturer if the camera needs to be attached to the wall or ceiling of your home. If the camera provides visual feedback for your pet, then ensure it is set at their eye level when they are either stood or sat in front of it. Next, connect the camera to your home Wi-Fi and download the appropriate app on to your Smart device, tablet, or laptop. Connect the app to your camera following the specific instructions that are provided with your specific camera. Do not forget to change any pre-set passwords to ensure that your connection and any Cloud storage are private and secure. Adjust your motion and sound alerts so that they send alerts when your dog is in range or is barking, but they are not so sensitive that flies or the wind set them off. A: To get the most from your pet surveillance camera it needs to be set up in the main room that your dog is in when you are out of the house. For example, if you limit them to the kitchen, then this is where the camera needs to be placed. If your dog has the run of the house, then pick a room at has their favorite spot. If the camera provides treats, then they will soon favor this spot, even more, when you are away from home. Q: Can I use a dog camera outdoors? A: Some dog cameras are suitable for outdoor use, but you should always check the individual manufacturers guidelines before setting up a camera outdoors. It is also a good idea to ensure that if the camera is outside it is not overlooking your neighbors or capturing images from public places, this is even more important if your camera records video or captures images.